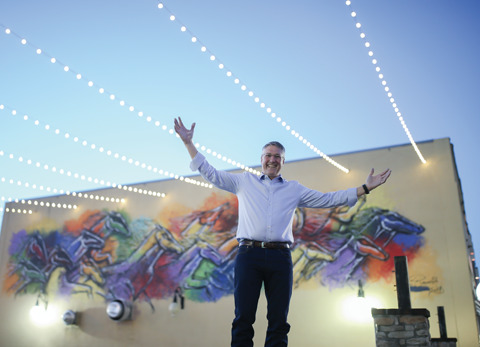 When Lance Shackelford brought Outdoor Lighting Perspectives to Northeast Arkansas in 2016, quickly followed by Central Arkansas the following year, he knew he had found a company and a service that was a great fit for the city he calls home. He is passionate about the design, installation and service of custom outdoor and landscape lighting systems in Northeast Arkansas and Central Arkansas, and the community has been incredibly supportive of his growing business. For many years, Shackelford was in the oil and gas business as a contractor for XTO Energy’s office in Heber Springs. After his hours began slowing down, he was given the opportunity to move away to Texas, North Dakota, Pennsylvania, Oklahoma or Kansas, but he and his wife, Raquel, who now owns Eden Spa and Noah Children’s Boutique, longed to stay in Jonesboro. Shackelford was confirmed in February 2016 and opened Outdoor Lighting Perspectives in NEA the following June. After early success and high demand for the design, installation and service of custom outdoor and landscape lighting systems in Jonesboro and the surrounding area, the franchise owner decided to take on another location. The Outdoor Lighting Perspectives Jonesboro – Little Rock owner started off working part time for his franchise, which has now grown to include two additional full-time employees. The company can work with any budget and has done projects from as few as five lights to as many as 144, whether it’s highlighting a water fixture or trees at a residence or lighting up a local business. “To start out, we go out in the day and survey the property and talk to the homeowner to see if there are any specifics they want to highlight,” said Shackelford. “Then, we schedule a nighttime demonstration. We set up a lighting kit to help them see it before they buy it, which also helps us with our design. If things go well, we then schedule an install. Shackelford and his team also worked with Downtown Jonesboro business owner Ted Herget and Downtown Jonesboro Association’s Lyndsey Ford Wingo to help light the area better for residents and patrons. From lighting up Downtown Jonesboro to jobs in Paragould, Mountain Home, Calico Rock, Searcy, West Memphis, Little Rock and Alexander, and even handling the lighting for Junior Auxiliary of Jonesboro’s 2019 Charity Ball, Outdoor Lighting Perspectives Jonesboro – Little Rock continues to impress its clientele. Outdoor Lighting Perspectives’ parent company, Outdoor Living Brands, is home to four other companies – Archadeck, Conserva Irrigation, Renew Crew and, until its recent sale, Mosquito Squad. Shackelford said he was drawn to the company because they are so easy to work with and offer a quality product with warranties and service they stand by. “One of the things we do that sets us apart from other businesses is the service,” he said “That’s one of the top things – if you call with a problem, we immediately take care of it. Add that to the quality of the product and installs, and we have something I’m really proud of. For more information, call (870) 273-8740, visit jonesboro.outdoorlights.com or find Outdoor Lighting Perspectives (Jonesboro & Little Rock, AR) on Facebook.